The William Blake Archive is pleased to announce the publication of an electronic edition of Blake’s ten monochrome wash drawings illustrating Mary Wollstonecraft’s Original Stories from Real Life and the first and second editions of the book containing Blake’s six engravings of his designs. The designs and inscribed texts in all three series are fully searchable and are supported by our Inote and ImageSizer applications. In 1788, Joseph Johnson published the first edition of Mary Wollstonecraft’s morally instructive narrative for children, Original Stories from Real Life; with Conversations, Calculated to Regulate the Affections, and Form the Mind to Truth and Goodness. A few years later, Johnson decided to issue a new edition, for which he commissioned Blake to prepare a series of illustrations. Blake’s extant drawings, now in the Rosenwald Collection, Library of Congress, are datable to c. 1791. In addition to these ten designs, Blake must have executed at least one further drawing as a preliminary for his fifth plate; this drawing is untraced. Six designs were selected for publication in the 1791 edition of Wollstonecraft’s book; Blake engraved the designs himself. The first and second states of Blake’s plates appear variously in copies of the 1791 edition. The second edition to contain Blake’s plates was published by Johnson in 1796; it contains the third (final) states of Blake’s plates. The copy of the 1791 edition now in the Archive is from the Huntington Library; it contains the second states of the plates. The copy of the 1796 edition in the Archive is from the Essick collection and contains the third (final) states of the plates. With this publication, the Archive adds a new set of scholarly tools. These tools, known collectively as our Related Works system, are designed to show relationships among works and individual objects in the Archive. They function at two levels. First, work index pages now include active links to related materials in the Archive (for example, a set of preliminary sketches for a group of engravings). 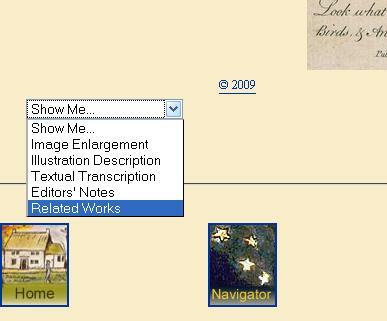 Second, the “Show Me” menu on object view pages now includes “Related Works in the Archive.” Like the work-level menu, this list includes active links to the related objects and is meant to allow study of the related materials side-by-side. The Wollstonecraft illustrations are the first publication in the Archive to use this feature. As always, the William Blake Archive is a free site, imposing no access restrictions and charging no subscription fees. The site is made possible by the University of North Carolina at Chapel Hill and the cooperation of the international array of libraries and museums that have generously given us permission to reproduce works from their collections in the Archive.